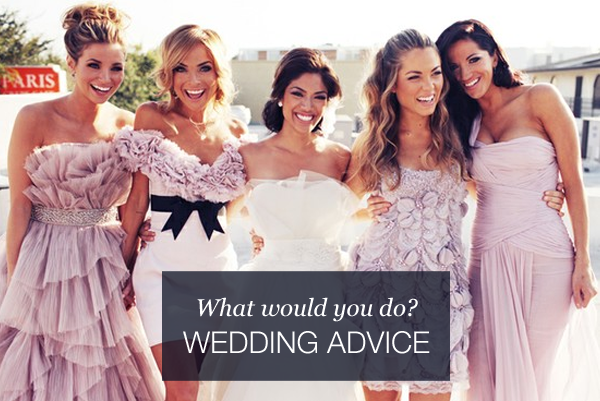 Wedding Advice: How do you tell a friend she wont be included in the bridal party? See our previous advice posts here & here. Question: How do you tell a friend that she wont be a bridesmaid? KAELLA'S ANSWER: If you feel the need to explain, be honest with her. I’m sure she’ll understand that you cannot fit every friend into your bridal party. There are so many ways to incorporate your friend into your wedding day aside from being a bridesmaid; readings, toasts, ceremony rituals. And there is no rule against inviting her to your bachelorette party, so she can still be part of all the fun stuff! RACHEL'S ANSWER: Whether you told a friend she would be a bridesmaid or she wrongly assumed, it’s better to make the situation clear sooner rather than later. If she says, “When are we going bridesmaid dress shopping?” don’t give her a vague answer and keep stringing her along. Tell her directly (phone or email is fine if that’s how you always talk) that you didn’t expect to have to say this, but aren’t able to ask her to be a bridesmaid. If you can give her an honest reason (you’ve already accounted for your two sisters, your fiance wants his sister in the wedding, and you’d already agreed to keep the bridal parties small), you should be honest. “I tend to get overwhelmed easily with lots of people fussing over me, so I’m trying to keep the number of people around me before the wedding to a minimum.” You know -- it’s not you, it’s me. Classic for a reason. And note to all brides -- try to avoid this dilemma by not talking to all of your friends as if they are potential bridesmaids the second you get engaged! Yes it may seem like a given that all five of your BFFs from childhood will be your bridesmaids, but until you’ve talked to your fiance and your families and set a budget, it’s better not to make any promises so you can avoid hurt feelings and awkward conversations later. What should I do if my Maid of Honor isn’t fulfilling her duties?